YESSSS, so excited for my second Co-Op Crate box but also soooo so so sad because they’ve also closed down! Noooo I loved them! This one is the Salt + Sea + Sun box and even better than the last! Eeeek! The Co-Op Crate brings together the very best of small businesses from around the world, such fun and enjoyable small batch and artisan products. Perhaps you’ll get some treats, home products, bath and beauty items, the options are endless! Once again I’ve never heard of any of these products except the taffy and I’m so happy the Co-Op Crate introduced me to them. They are all made with love, with purpose and are supporting small businesses. These guys seem super passionate about that as well which I like. 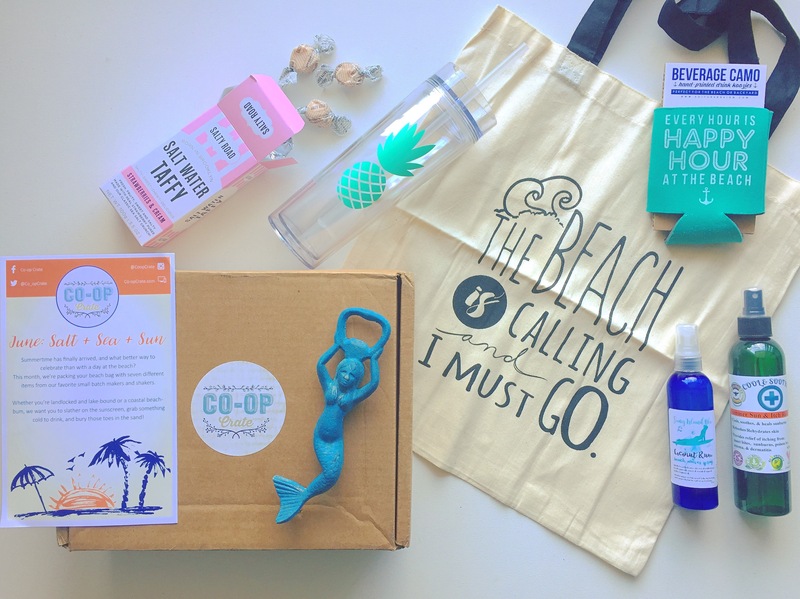 In this box we have a bunch of fun stuff to get you prepped for summer, right in time too! Pineapple Tumbler from Pineapple Proper – perfect for an icy cold become by the pool or beach, fill with lemonade or a little cocktail! Koozie by Sxit 343 Designs – grabbing a cider can from the cooler instead? Put this fun Happy Hour koozie on it to keep it nice and cold! Mermaid bottle opener by The New England Beach Company – oooo they have u covered, got a bottle o beer to open up? This mermaid opener is so fun! Coconut Rum Sea Salt Spray by Suny Island Blu – want the beachy waves look? Just scrunch and go with this lovely scented hair product. After sun and itch spray by He B G-Bees – in case you fall asleep in the sun, spray a little of this one to cool you down. Strawberries & Cream salt water Taffy by Salty Road – a little treat to satisfy ur cravings. Tote by Breakout Press Co – and of course a beachy tote to carry everything in! Super cute! Although they’ve closed I still want to give them a shoutout, such a great box and company, sad to see them go. Be sure to check out the companies they featured still thou!